When I bought my GoPro I went ahead and bought an extra battery from Best Buy for $19.99. I think it would be a great idea if you plan to use your GoPro quite a bit to always have an extra battery handy. In order to charge your battery you have to take your GoPro out of the case, on the side there is a battery compartment, take the cover off of that and you plug in the USB cable then put the other end in your computer or you can use an adapter like you might for your smartphone and plug it in to an electrical socket. This will charge your battery and the light will flash red until it is fully charged. To charge your extra battery open the battery compartment, take the original battery out, put your extra battery in and close the compartment. Plug it back into your computer or adapter and charge that battery. When I first purchased my GoPro I had planned to take videos of my kids playing lazer tag at my oldest son’s birthday party so I got it all charged up and ready to go. I spent some time getting the GoPro app downloaded onto my phone and connected to the camera via WiFi so I could see on my phone what was being video taped while we were running around playing lazer tag. Well sadly I messed up and didn’t get the lazer tag video because I hadn’t used the camera yet, I had let it sit on my desk for two days before the birthday party, I didn’t bring the extra battery that I had charged and although I turned off the WiFi app on the phone I did not turn off the WiFi on the camera. The camera battery is supposed to last about two hours according to the GoPro website’s comparison chart or an hour and a half if it’s on WiFi and you’re using the app. It probably lasted on my desk for about that hour and a half and by the time we got to the skating rink to play lazer tag it was dead and I hadn’t brought the extra battery. Like most things I learn the hard way, that won’t happen to me again, I will always bring the extra battery and I will be checking to be sure it is charged before I leave the house! Check out my YouTube channel for more GoPro videos on how to remove your GoPro from the packaging and how to get the best deal on GoPro accessories. When I bought my GoPro I thought it would be a great test drive to try it out at my oldest son’s birthday party last weekend. We were going to play lazer tag at our local skating rink, so I was trying to figure out what would be the best way for me to wear the GoPro while the kids are playing lazer tag and I was planning to play also. My first thought was, there is no way that I’m wearing this thing strapped to my head. I thought maybe a chest harness would work so I looked into that, then I realized that I would have a harness on while playing lazer tag so I couldn’t do the chest harness. Then I found a clip, there is a quick clip that you can get and I thought that would be perfect so I bought a set at Best Buy that has a head strap and a quick clip in the package. I thought I could use the quick clip to attach the camera to my lazer tag harness. Well, I bought the set for $19.99 and I also bought a floating handle grip for the kids to use since they’re at the pool a lot and it will keep the GoPro from sinking. The Handler was $29.99, then when I got home from the store I realized that I’d probably need a case, something to protect the camera while we’re carrying it around and going places. I found an accessory kit and case on Amazon for $45.99 and it came with 38 pieces inside. It came with a smaller case inside, a floater like the handler I bought, maybe not as pretty but it does the same job. It also has a monopod or selfie stick, whatever you want to call it, it’s got a tripod and tripod adapter because the GoPro will not screw right onto a standard tripod so whatever kind of tripod you want to use you’ll also need an adapter. It came with a bicycle clamp, a suction cup mount to attach to the dashboard of your car, an extender piece to make any mount taller, it also came with the clip that I was wanting, a wrist strap, a chest harness and a head strap. It also included a whole bunch of other mounts, adhesive mounts, replacement parts, other straps, and anti fog strips. This kid for $45.99 was $4 cheaper than the two other accessories that I bought so I think I’m taking the first two back and keeping the accessory kit that I bought. It was a much better deal, gives me many more options, and it came with the case and the clip I originally wanted as well. I’m thrilled with my purchase of the GoPro Accessory Kit , I’m sad that I have to go back to the store to return the other two things, but I’ll get more money back for those than I spent on the two original accessories that I purchased. Most stores have options like Best Buy’s Price Match Guarantee where they will match the prices, including online prices at places like Amazon, for an identical item, but I found that even though Amazon’s prices for the two accessories I originally bought were cheaper than at the store, it was cheaper still to buy aftermarket accessories than to get the name brand and I’m very pleased with the quality of the items that came in this accessory kit. Be sure to watch my next video on GoPro batteries and battery life and you’ll see how I messed up my video of the kids playing lazer tag. You can also check out my post and video on the purchase of the GoPro and the problems I had just getting it out of the package. I just recently purchased a GoPro and I did a bunch of research online to figure out which was the best one for my family’s needs. The online deal at Best Buy was $399 for a GoPro Hero 4 Silver edition, plus you’d get a $50 gift card back when you buy one. When I got to the store to check it out in person it was on sale for $379 but no gift card. I mentioned the online deal and was told that this was a better deal because if I bundled some accessories with my purchase I’d get 15% off the accessories. Well the accessories were cheaper at Amazon so I asked about their Price Match Guarantee and ended up getting the GoPro for $349 and the accessories for a better deal than if I had bundled them and got the discount. I’m kind of late getting on the GoPro bandwagon because I have plenty of things to take videos with. I used my iPhone a lot for videos, I have a Canon DSLR camera that I use for videos and I have an old Flip video camera that still takes excellent videos so I didn’t think that I needed a GoPro but I recently talked myself into getting one because I thought it would be the best way to action videos of the kids, especially in moist environments like the pool, the water park and at the beach. So I went to Best Buy and I bought a GoPro Hero 4 and it’s the coolest little thing! I got it home and I really just wanted to take it out of the box and play with it but I learned that just getting it out of the box was a challenge. I have a Masters Degree in eBusiness and Technology, I have an IT job that I love and I consider myself to be technically savvy, but just getting the GoPro off the packaging was difficult. It comes with an outer sleeve that you have to take off, then you can get the top clear part off and you’ll see that it’s attached to the top of the inner box. I could not for the life of me figure out how to get the GoPro off the box. Now inside the box there are instructions, not a very big instruction manual, but they encourage you to go to their website for the rest of the details that you might need. I read the instructions three or four times and nowhere in here does it tell you how to get the camera off the box. I didn’t want to break the plastic part on top of the box because I thought it would be a great way to store it maybe, or the mount might be good for something else. Eventually I figured out that there are two tabs in the front, you squeeze the two tabs together and then the camera will slide right off. Once I got it all apart and took the inner box out of the inner box I saw the removal diagram right on the back, of course I was in too big of a hurry to play with it to even see that! Check out my YouTube channel for more GoPro videos on how to get the best deal on GoPro accessories and how I learned the hard way about battery life. I’ve been having a lot of fun participating in a weekly vlog prompt with Toni from Just Stop Screaming and some other blogging friends. This week’s topic is to tell you about our favorite music decade. I’m a huge music lover and have hundreds of songs in the playlist on my phone and literally over a thousand more on my desktop computer so I thought it would be pretty hard to pick just one decade. The cool thing is, the playlist on my iPhone actually shows the number of times that each song has been played so I scrolled through my list to see what that would tell me – as it turns out, I apparently listen to music from the 80s most often. My fave artists and bands from that time include the Cranberries, Talking Heads, Prince, REM, Violent Femmes, Love and Rockets, The B-52s, Eurythmics, INXS, Cyndi Lauper and U2. I’d love to hear about your favorite music decade, and your favorite groups. Thanks for watching! I’m looking forward to bringing you another video next week when we’ll be discussing our favorite lipstick. 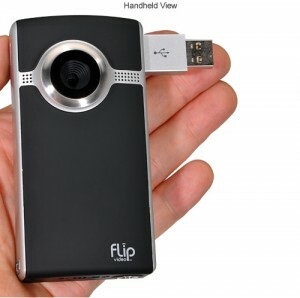 Flip Ultra Pocket Camcorder $38 Shipped! I have a Flip Ultra Pocket Camcorder and I LOVE it! The Flip fits in my purse, has six hours of battery life, and comes pre-installed with software that lets you easily upload your videos to YouTube or Facebook, and you can even grab “snapshots” from your videos. I thought I got a deal on mine, but this is the cheapest that I’ve ever seen a Flip! These are refurbished by the manufacturer and are being sold and warranted by TigerDirect, and you can get yours for just $37.99 with free shipping – that’s a whopping 71% off the regular retail price of $129.99!